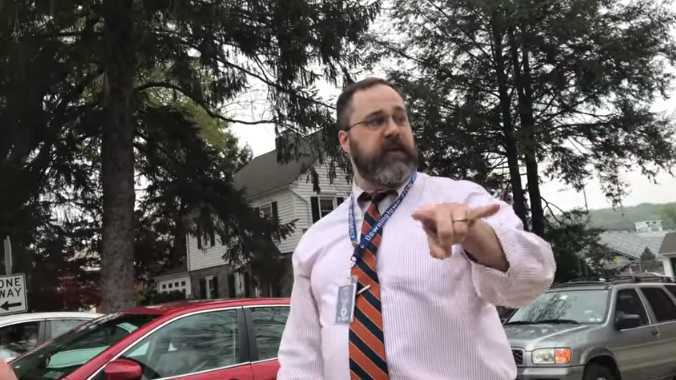 DOWNINGTOWN, Pa. — The Pennsylvania school administrator who was recorded on camera cursing out two teenage abortion abolitionists last month as they held signs on the public sidewalk has resigned. Zach Ruff had been on leave from Downingtown STEM Academy since the incident went public, as the Downingtown Area School District decried his behavior as being unacceptable. Ruffs has now admitted his wrong according to a statement from the district. “In reviewing the video, Dr. Ruff knew that the conduct he displayed was not representative of who he is and was not representative of the kind of educational leader he prided himself on being. Dr. Ruff has acknowledged that the demonstrators had a right to be on a public sidewalk. He acknowledged that his conduct cannot be defended or condoned and he deeply regretted his actions as displayed on the video,” it said. As previously reported, the incident occurred on April 21 as homeschooler Conner Haines, 16, and his sister Lauren, 19, held signs outside the school that bore messages both about preborn babies and salvation in Christ. However, they were soon approached by Ruff, who took issue with the subject matter and became irate. However, Ruff decided to resign this week in acknowledging his wrongdoing, and the district likewise publicly declared that the teens had a right to engage in free speech on the public sidewalk just as much as anyone else.